This concludes our series on workouts at the 2013 NFL Combine. Today we discuss defensive backs. In today’s game you can’t have enough defensive backs, especially corners. With offenses using 3, 4 and even 5 wide sets, you have to have plenty of guys to cover those receivers. You also need players that can cover from multiple positions. You can’t have corners that just play on just one side or just on the outside. You need players that can cover the outside and more importantly in the slot. If a team loads up with corners that can only defend on the outside, then the slot receivers will kill you, just ask the Eagles. Robert Alford-Southeastern Louisiana (5-10 188 lbs. ): Fast corner with quick feet. Ran 4.39 40 which was the 4th best defensive back. 40” vertical was just a ½” off of the best for DB’s. 11’ broad jump was 4th best. Able to compete in press coverage. Able to cover larger receivers and fight them for the ball. Can likely play outside or in the slot. Had a good workout. David Amerson-NC State (6-1 205 lbs. ): Height-weight-speed specimen. Tall with long arms. Good speed, running a 4.44 40 yard dash. Had a historic year in 2011 with 13 interceptions (2nd most in NCAA history). Struggled in 2012 from the very first game. Minnesota and Tennessee lit him up. Draft stock should be improving after running a sub 4.5 40. Has played more off coverage and zone. Likely a good fit for a slot corner or even a move to safety. Johnthan Banks-Mississippi State (6-2 185 lbs. ): Great height. Thin body with long arms. Considered one of the top 5 corners. Has loose hips for a corner his size. Ran a disappointing 4.61 40. Will have pressure on his pro day to improve his 40 time. Played safety early in his career and could move back to safety if he doesn’t have the speed to play corner. Matt Elam-Florida (5-10 208 lbs. ): Doesn’t have the height you normally want in a safety, but he has a nose for the ball and will flat out strike you. Explosive player that tracks the ball well. Rangy. Looked like a corner in on-field drills. Able to cover slot receivers. Had 26 starts for the Gators. Ran a 4.54 40 yard dash. Good workout. Dwayne Gratz-UConn (5-11 201 lbs. ): Corner with a long body type. Had very good measureables – 4.47 40, 22 bench press reps (4th best DB), 38” vertical and 6.70 3 cone (tied for 5th best DB). Stays low in backpedal. Quick feet and good closing speed. While he was considered the #2 corner for UConn, he should be moving up draft boards after this workout. Aaron Hester-UCLA (6-2 198 lbs. ): Great size for a corner. Is extremely physical, even to the point of being overly physical and hurting his team with penalties. Will challenge the receiver, but needs to learn how much he can get away with and when to back it off. Looked tight in his backpedal. Only ran a 4.62 40 which is a red flag. Did not have a good day. Robert Lester-Alabama (6-1 220 lbs. ): Safety that plays better in the box than in deep coverage. Has tight hips. Had several drops during on-field drills. Lacks the speed (4.66 40) to play the deep half of the field. Did not look good in on-field drills. Tyrann Mathieu-LSU (5-9 186 lbs. ): First off, I don’t trust anyone with an alter-ego especially when they refer to them by name. Is probably too short to be an outside corner, so will have to play in the slot. Looked very good in on-field drills. Very smooth in his backpedal and changes direction extremely well. Very fluid movement. Another red flag was his bench press, 4 reps, really? I just don’t trust this guy and I wouldn’t have him anywhere near my team. Deion (or Leon, whichever one spoke to him) may be good with him, but that doesn’t make me feel a whole lot better. He was arrested in October for marijuana possession and that was two months after he got kicked off the team. He has tremendous athletic ability, but isn’t shutdown corner. He wouldn’t even be on my draft board. Brandon McGee-Miami (5-11 193 lbs. ): Ran faster than expected (4.40 40). Very quick, but was a bit upright in his backpedal. Looked a little tight in his hips. Dropped some balls in on-field drills. Probably improved his draft status with his 40 time, but the on-field drills were not as impressive. Dee Milliner-Alabama (6-0 201 lbs. ): Everyone wanted to see how fast he was and he ran a very nice 4.37 40 (2nd best DB). Good height-weight-speed specimen. Stays nice and low in backpedal. Played a lot of press coverage for the Crimson Tide, but not much in off cover. Works very hard. Had a few drops, but that may just be from nerves. Came in as the #1 corner and he did nothing to change anyone’s mind. Jordan Poyer-Oregon State (6-0 191 lbs. ): Good size corner with a nose for the ball. Ran a 4.54 40 which is good, but not great. I don’t think the speed will hurt his draft position. Looks very smooth and flips his hips well to run with receiver. Has quick feet which allow him to undercut the receiver. Gets his hands on a lot of balls. Solid prospect that didn’t hurt or help his draft stock. Eric Reid-LSU (6-1 213 lbs. ): Explosive lower body (40.5” vertical and 11’ 2” broad jump were best for DB’s). Ran a 4.53 40 which is good for a safety. Long and tall. Good closing speed. Plays the run and pass equally well. Has the size and speed to cover tight ends and slot receivers. Had a good workout and likely increased his draft position. Xavier Rhodes-Florida State (6-1 210 lbs): Another height-weight-speed guy. Long body type with long arms. Ran a 4.43 40, 40.5” vertical (tied for best among DB’s) and 11’ broad jump (tied for 4th best DB). Has the size and speed to defend outside receivers. Darius Slay-Mississippi State (6-0 192 lbs. ): Came into the Combine as the “other” corner from Mississippi State, but he had a better workout than his teammate. Ran the fastest 40 of a defensive back (4.36). Has a nice backpedal and smooth hips. Moves his feet well. Has the size to get the ball at its highest point. Really stood out and had an excellent day. Rod Sweeting-Georgia Tech (5-11 189 lbs. ): Looked very fluid in on-field drills. Intelligent player with good instincts. Good hands and catches the ball well. Jamar Taylor-Boise State (5-11 192 lbs. ): Ran very well, 4.39 was the 4th best 40 for the DB’s. Bench pressed 22 reps, tied for 4th best DB. 4.06 short shuttle tied for 5th best DB. Looked fluid in on-field drills. Shamarko Thomas-Syracuse (5-9 213 lbs. ): Short and compact but strong. 28 bench press reps was best among DB’s. Has an explosive lower body and had a 40.5” vertical jump (tied for the best DB) and 11’1” broad jump which was 3rd among the defensive backs. Good straight line speed, but is a little tight in the hips. Played as a strong safety but might have the speed to play free safety. Desmond Trufant-Washington (6-0 190 lbs. ): Was born to play corner. Brother of Marcus Trufant (Seahawks) and Isaiah Trufant (Jets). Very natural movement. Fast (4.38 40) and looked extremely smooth in on-field drills. Gets in and out of his backpedal very well. Kenny Vaccaro-Texas (6-0 214 lbs. ): Versatile. Able to play in the box and cover the slot. Quick feet. Plays a little bit high in his backpedal. He is the #1 rated safety by most experts, but I can’t get the Oklahoma State game out of my head when he missed several tackles. He doesn’t always take the right angle and he can be juked in space. Struggles when he has to be the last line of defense. If I had to pick between him and Elam, I would take Elam. B.W. Webb-William & Mary (5-10 184 lbs. ): Small school corner that has come out of nowhere to create quite a buzz. Had a good week at the Shrine Game and had a good Combine as well. Smooth backpedal and has good transition to run with the receiver. Good footwork and technique. Showed good lower body explosion with by jumping 11’ on the broad jump (tied for 4th best DB) and 40.5” vertical (tied for the best DB). He is a guy that has raised some eyebrows this offseason. 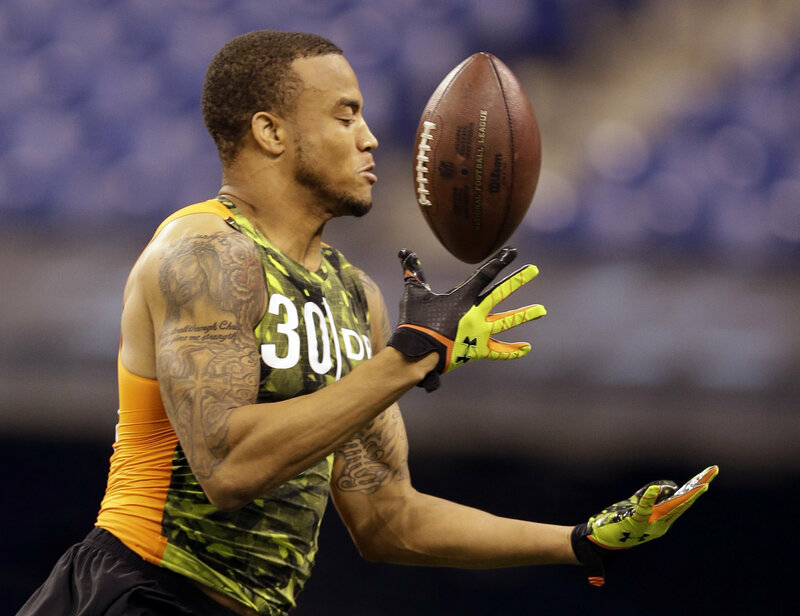 This entry was posted on March 8, 2013 by draftmaniacs in All-Star Games and Combine, Scouting reports and tagged 2013 NFL Combine, 2013 NFL Draft, 2013 NFLDraft, Aaron Hester, Alabama football, Blidi Wreh-Wilson, Darius Slay, David Amerson, Dee Milliner, Desmond Trufant, Florida State football, Johnthan Banks, Jordan Poyer, Kenny Vaccaro, Matt Elam, NFL, NFL Draft, Shamarko Thomas, Tyrann Mathieu, UCLA football, Xavier Rhodes.